Jingle bell, jingle, jingle bell rock! Jingle bells are one of my preschoolers’ favorite learning material this month! Actually probably THE favorite. They are magnetic and they jingle. We are using them in our math activities, science, and in circle time. I find that it’s easy to overthink things when it comes to setting up sensory bins or small world play areas. In my experience, my preschoolers like when things are simple without a lot of direction and rules associated with play in the classroom. This makes it easy to keep things simple and still offer fun learning environments! In our “Jingle Bell Rock” sensory bin, we have jingle bells, black rocks, and a sparkly Christmas tree. The next time we play, I’ll add small shovels too. The rocks were fun to pick up with fingers, but shovels would have added a new element of play! 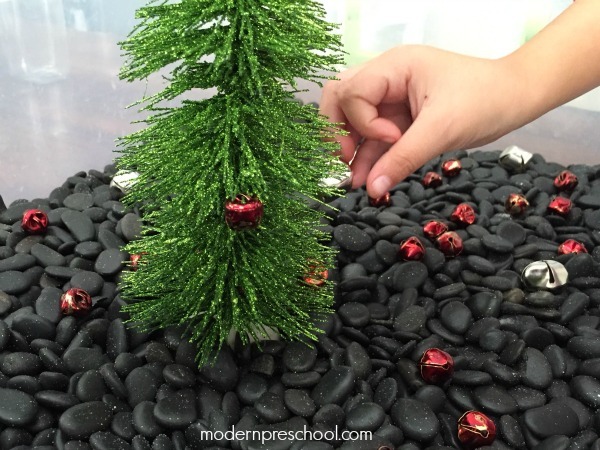 Adding musical instruments, small people, or even Santa’s sleigh could easily change this from a sensory bin to a pretend small world! 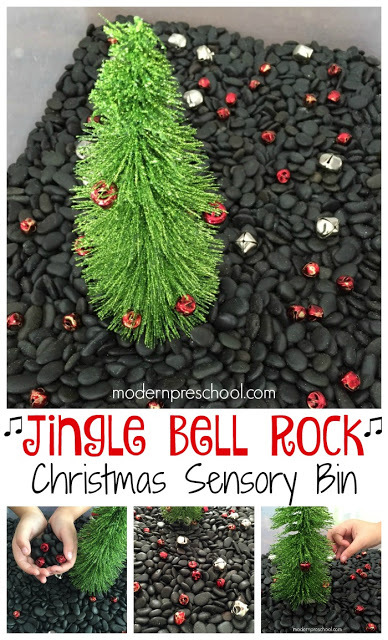 The “Jingle Bell Rock” sensory bin is full of different textures. The rocks are silky smooth while the tree is pokey. The jingle bells not only jingle when you shake them in your hand, but also as they fall down and land on the rocks at the bottom of the bin. 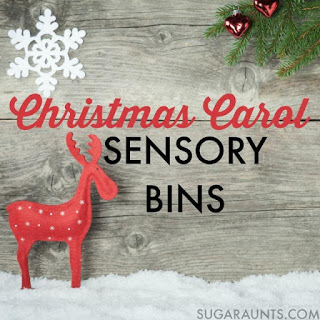 Besides the different textures of the materials in our sensory bin, fine motor skills are also being used and strengthened during the jingle bell play. 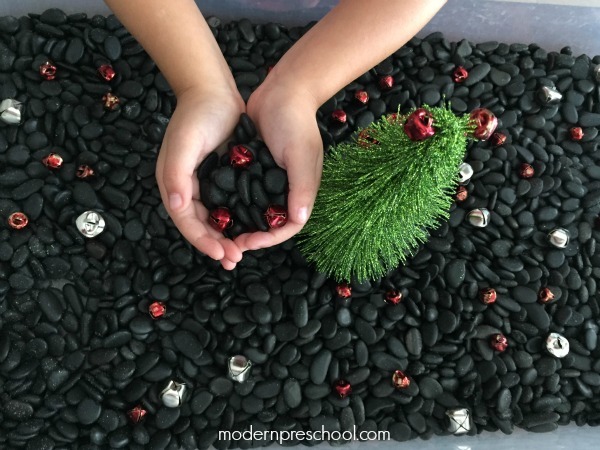 My preschooler immediately filled her hands with jingle bells and rocks over and over again. 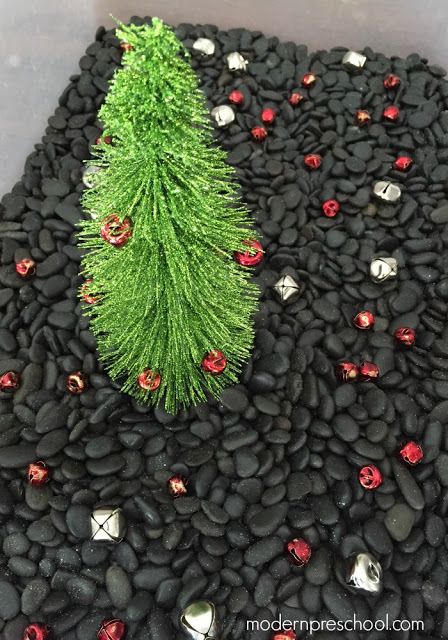 But after that she decorated the Christmas tree with the small jingle bells. The small area was difficult to maneuver onto the tree branches. It took patience and strong fine motor muscles. Before long the whole tree was decorated! If you love jingle bells as much as we do, head over to our watch our Dancing Jingle Bells video! 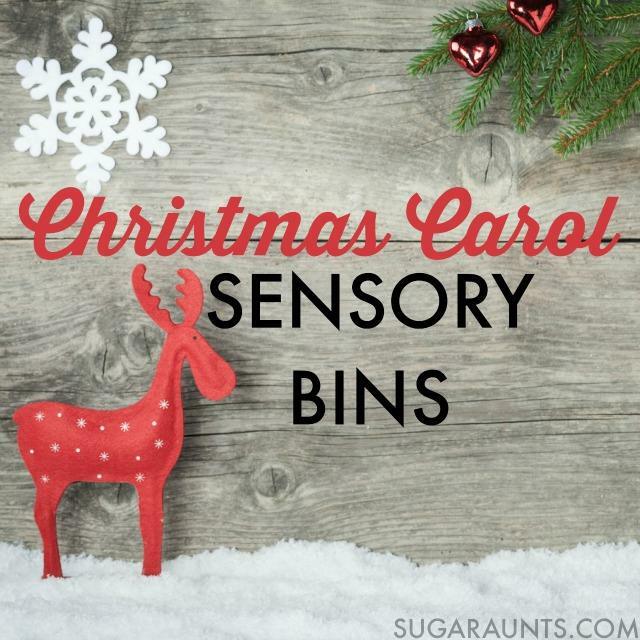 Don’t miss any of the other sensory play ideas in the Christmas Carol Sensory Bin Blog Hop! Beautiful! Those rocks look so wonderful to touch and I love the play on words by adding the rocks! Ooo, I love this! My youngest is constantly playing with rocks-I would never have thought to give them a Christmassy touch. Wow!! Great pictures!! I want to play!! Hi! Love this! Can I ask where you got the rocks? Hi Kara! Someone gave these rocks to me, but check the dollar store. They have bags of rocks similar to these sometimes.